A compact miter saw with lightweight frame that will be sufficient for every aspiring craftsman out there. So here’s the thing, Miter saws come in a variety of sizes, and many mistakenly think they need some giant saw to do anything above basic home project use. The truth is, most can get by with smaller versions in most cases, especially if you work with materials like plywood, decorative panels, soft fiberboard, hardboard, and aluminum sashes. Hitachi has a stronghold on the economic, more compact portion of the power saw world, and the C10FCE2 is probably one of the reasons why. If you’re someone that doesn’t require a large miter saw with rails for extended cutting, and need something light, mobile, and powerful, the Hitachi C10FCE2 may be just what you need. At 26.3 lbs, the C10FCE2 is actually the lightest and most portable compound miter saw in its class, so you should have no trouble transporting it around when needed. Set up is a fairly simple and easy as well. Despite its smaller size, the C10FCE2 uses a 15-amp motor that can generate a no-load speed of up to 5,000-RPM, which is far above many larger miter saws built for professional use. This makes any type of cut much easier, effortless, and much smoother too. A horizontal handle with a vibration-reducing elastomer grip provides outstanding comfort and helps to keep you in full control at all times, instead of having to deal with annoying vibrations and movement. The saw’s table gives you a stable guide, strong support with added stability, and a built-in clamping system you can use to hold your workpieces down. The saw comes with thumb-actuated positive miter stops you can use to make miter adjustments between 0 and 52-degrees left and right. The design lets you easily change the angle of the cutting blade for the times when you need to make miter cuts in crown molding and other pieces of trim. The C10FCE2’s bevel has a range of 45-degrees to the left, and a large extended flip fence can raise up 4 full inches so you can cut large workpieces that range up to 2-5/16-inches high and 5-21/32-inches deep. The saw also comes with a handy dust collector to help cut down on sawdust and particles flying all over the place, and easily accessible carbon brushes allow you to replace brush as needed, helping your saw perform at a high level over the long term. 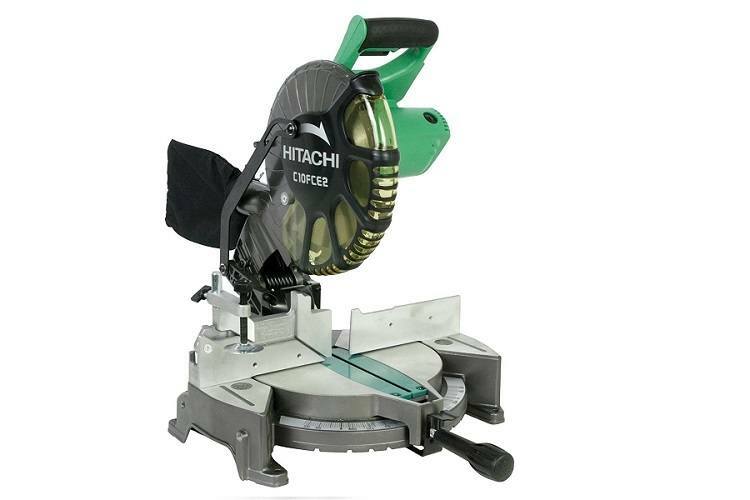 The C10FCE2 is compatible with Hitachi’s UU610 miter saw stand, and comes with a 10-inch 24-tooth TCT saw blade, vice assembly, 10mm box wrench, and a material support extension. The C10FCE2’s most obvious advantage is its smaller size and very low weight. For those who get tired of lugging around 50 or 60+ lb miters all the time, this saw provides a much needed solution, and it doesn’t slack on power and accuracy. The 15 amp motor delivers up to 5,000 RPM, which as I noted earlier, is much more than you’ll usually see with these. You can definitely feel it when you use the saw. It cuts through a variety of wood materials with ease and even thin aluminum with the right blade. Considering this saw lacks a slide to expand its range, it still offers a very impressive cutting capacity, and should be able to take on a good portion of common jobsite tasks and workpieces. This particular model of the C10FCE2 is the no-frills version, meaning it doesn’t come with a laser marker or stand. This helps keep the cost down to a very affordable range for most anyone, and you do have the option of including the stand and laser for a higher price if you’re inclined. Just a few minor complaints, which seem almost petty considering the price and overall performance of this saw. As with many other saws, the dust collector bag was not the saw’s strongpoint. The dust has the tendency to kind of fly off the blade, and the bag does not collect all that much of it. Consider it a trade-off for getting such a great saw for this price. Although the C10FCE2 is more than capable of attaching to a workbench, it does not come with the hardware, so you’ll need to do that on your own volition. It’s also worth mentioning that the screws used to change the bevel angle are difficult to get a wrench in when trying to turn. This is a common issue, and you’ll figure out the feel for it after a few attempts. The Hitachi C10FCE2 is great for trim carpenters, framers, and woodworkers who need precision and power on the work site, but don’t want to haul around the giant, heavy miter saws. The size and price make this an ideal purchase for DIY home enthusiasts as well. At the end of the day, it’s hard to compete with such a solid brand name miter saw that is equally suited for home workshop and project use as it is light to moderate contracting work. 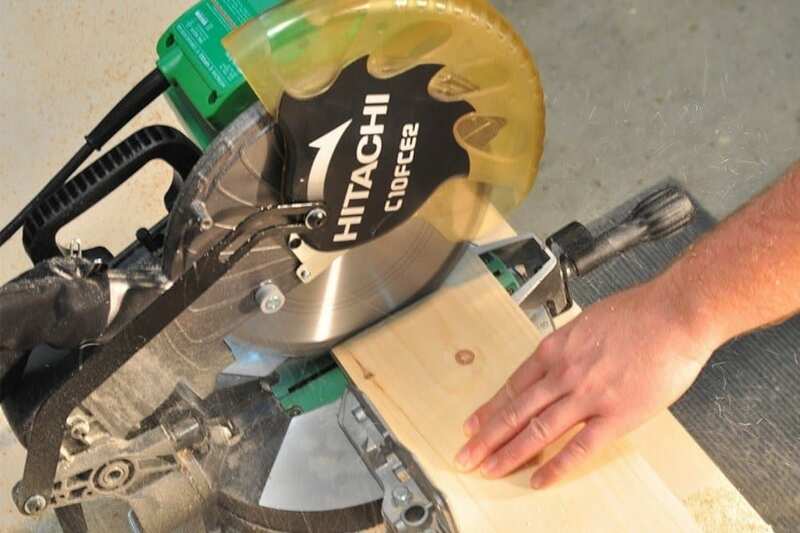 The saw is already great on its own, but the low price and ability to add extra features as desired make the Hitachi C10FCE2 one of the best buys around.